Press release from Bright Kids in Crabbs Cross. 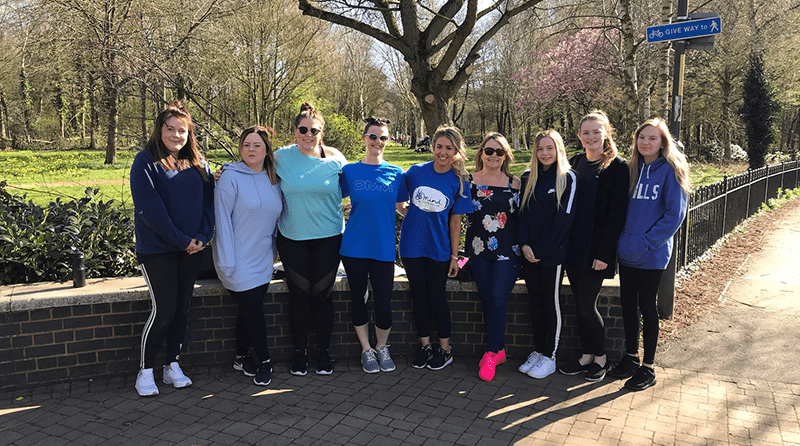 A team of nursery workers from Bright Kids in Crabbs Cross put their best feet forward on Sunday 24th March as they trekked around Arrow Valley Lake to raise funds for MIND. The charitable team of 10 pulled on their walking boots, dressed in blue and clocked up 5 kilometres to support the charity that offers information and advice to people experiencing mental health problems and campaigns to improve services, raise awareness and promote understanding. The team decided to get involved after Social Media Manager, Zoe Tolley, from Bright Kids Head Office completed Red January, also raising funds for Coventry and Warwickshire MIND. This year MIND partnered with Red January – an initiative aimed at getting active to support mental health. Whether running, walking, swimming or cycling, it’s a no pressure movement with the goal of exercising every day for the whole month of January, with all sponsorship money going to the charity. Zoe said: “I decided to run, walk or swim every day throughout January to support MIND because it is an amazing charity that provides support, resources and the opportunity for a cuppa to anyone and everyone suffering with their mental health. Zoe raised over £120 by completing Red January. So far, the Crabbs Cross team has raised over £60 to add to this and you can still donate to Bright Kids’ cause by contacting the nursery. For more information about Bright Kids Nurseries visit www.bright-kids.co.uk, email hello@bright-kids.co.uk or call 01527 452430. For more information about MIND, visit www.mind.org.uk.